As the controversial advert asks: Are you beach body ready? You are now, thanks to a new suit that gives you a superhero physique without giving up your life to the gym. Called the Flex Design Suit, it comes with the muscles predefined, so all you have to do is squeeze into it. You can choose your muscle level, from lean to mega giant. The latter makes Captain America look like a dweeb. Pick a colour, and specify whether you want the suit airbrushed and to come with veins (hell yes!). The only problem is you might not get many clothes over the top of it. The suit is made of flexible lycra that holds right to your body, so you shouldn't suffer any embarrassing mishaps like your pectoral coming loose and hanging off. It zips up at the back, so be prepared to ask for help getting out of it at the end of the night. Not very superhero-esque, admittedly. And you'd better hope you know the person pretty well, or they might be in for a surprise when the beefcake they brought home hangs up his muscles. One issue is that the suits are only available in male versions at the moment. Where are the options for all the budding female superheroes out there? 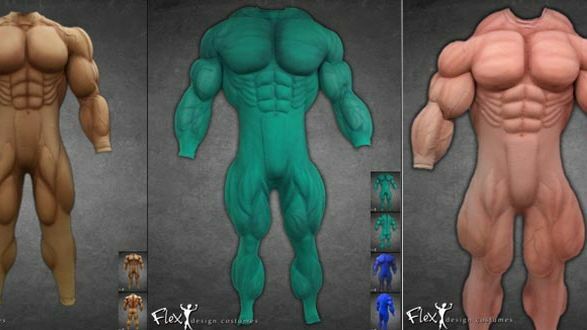 The lean muscle suit starts at $919 (£596) while the mega giant will set you back $3,499 (£2,270). Not cheap certainly, but think of the hours, effort and the huge amount of money in gym subscriptions it would take to achieve that bod for real. You can also buy a custom muscle suit that can be built to your specifications. For more, head to the Flex Design website. Though we feel we should add these suits don't give you actual superpowers or crime fighting abilities. Stay safe.